Refurbished in 2010, the France is a prestigious ship with a relaxed atmosphere and the most excellent cuisine. Come on board and experience fine river cruising for yourself! 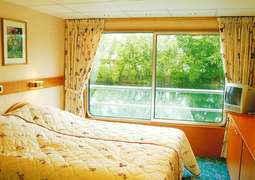 The 78 cabins of the France are comfortably furnished and feature either large panoramic windows or portholes which gives you a magnificent view of the passing scenery. Each cabin also contains a TV and adjustable air conditioning to give you a trip free of any discomfort. On board the France you will be provided with excellent meals from the best of French cuisine served with fine wines, all complete polite and attentive service staff. The restaurant has a fantastic panoramic view outside which you can enjoy while dining. The evenings give you a chance to have a nice drink and get to know your fellow passengers. The panoramic lounge contains a dance floor which gives you the perfect opportunity to dance the night away. For a quieter time you can either sit up on the Sun deck on a deck chair and soak up some rays as the beautiful scenery passes by or you can visit the library which has a selection of interesting books for your perusal.